While we’ll leave most of the E3 gaming announcements today to the gaming press, there is one bit of news that has come out of E3 that’s going to be relevant for Windows users. 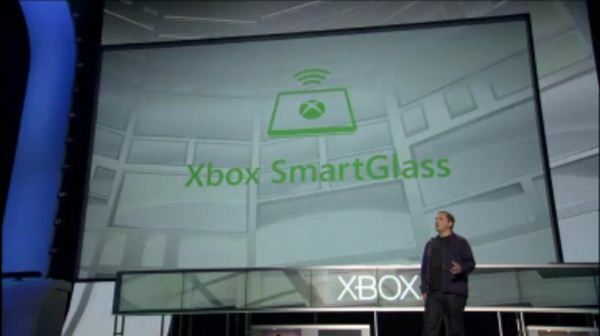 As previously rumored, Microsoft used E3 to announce their SmartGlass companion service for Xbox. If you’ve played around with Windows 8 or Windows Phone 7 then you’ve already seen pieces of this, as SmartGlass is the functional successor to Microsoft’s Xbox Companion application – and in all likelihood built upon Companion too. Xbox SmartGlass effectively extends what Companion could already do by not just giving client devices the ability to control the Xbox 360 – a function that will be increasingly important as SmartGlass devices will be the controls for Internet Explorer on the Xbox 360 – but also access to some forms of Xbox content. On the content consumption side Microsoft is currently pitching it as a way to watch movies and videos, including the ability to swtich between a SmartGlass device and the Xbox 360 on the fly. And while it isn’t made explicit in their demo or press releases it looks like this is limited to content from the Xbox Live service, making it something closer to synchronized media playback devices than something pushing content around like DLNA or Apple’s AirPlay. As for the gaming side of things, Microsoft is pitching SmartGlass as a way to use tablets and phones as a secondary touchscreen display for gaming purposes, à la the touchscreen-equipped Wii U Gamepad. Again Microsoft is being brief on their details here, and it’s not clear whether these are operating as independent devices or playing back a video stream from the console (Wii U), though we suspect the former based on how resource starved the Xbox 360 is even without the workload of SmartGlass. In which case however this also means gaming is going to be limited by tablet capabilities, especially if SmartGlass is supported on the ARM-based WinRT as is almost certainly the case. In any case, Microsoft quickly showed mockups of both scenarios in action on an unnamed Windows 8 tablet. At this point in time only Windows 8 and Windows Phone are specifically mentioned as supported platforms, however Microsoft also says “other portable devices” in their press release, which can be taken to be either WinRT or possibly 3rd party devices. Microsoft hasn’t announced a specific date for the service, but given the reliance on Windows 8 it’s certainly no sooner than later this fall. Great idea, lets see how it works in practice though. And IE on Xbox as well now? About time. Looks like it will look almost exactly like the Metro IE in Win 8. Hope it also has Flash support then.